Son Heung-min was supposed to be South Korea's savior, but the usually reliable attacking ace couldn't come to the rescue on Friday, as South Korea bowed out of the quarterfinals at the Asian Football Confederation (AFC) Asian Cup. Following his team's 1-0 loss to Qatar in Abu Dhabi, Son admitted to running on fumes. "I wasn't properly prepared. I was physically drained," Son told reporters at Zayed Sports City Stadium. "I am sorry that I disappointed my teammates, coaches and fans with this performance." Son joined South Korea only after the national team had played two group matches. It was part of an agreement between Son's Tottenham Hotspur and South Korea, whereby the Spurs made Son available for the Asian Games last summer in exchange for holding him back for the early portion of this tournament. South Korea managed just one goal apiece against the Philippines and then Kyrgyzstan. And Son, the national team captain, was expected to provide an immediate boost, and the versatile attacker, a contender for the Premier League's Player of the Month for December, made some positive impact in South Korea's 2-0 win over China. But in the ensuing two matches, a 2-1 win over Bahrain on Tuesday in the round of 16 and then Friday's loss to Qatar, Son was well off his game. But Son, who arrived in the United Arab Emirates on Jan. 14 and played the full 90 minutes against China two days later, hit a wall. He had already played a heavy schedule with the Spurs, and all that action and traveling had taken a toll on the 26-year-old. "I'd rather not talk about this, but (in the buildup to the tournament), I rarely felt great physically," he said. "I was losing sleep. I should have taken better care of myself." South Korea had five days off between their final group match and the first knockout game. 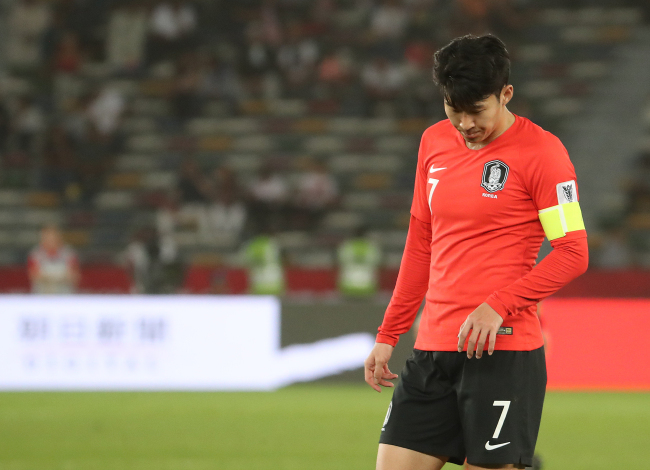 In the round of 16, South Korea got dragged into extra time against underdogs Bahrain, and Son played the entire 120 minutes. And three days later, it was more full-time action for Son, who ended the tournament without a goal. "I thought I would start to feel better (after the China match), but it didn't happen," Son said. "I know a lot of people expected big things out of our team. I was so mad at myself for not being able to play well. I think we ended up getting this result because of my play." Son said South Korean players should look at themselves in the mirror after the earlier-than-expected exit from the tournament.